Antibacterial, rejuvenating and stimulating. Sage has been valued as medicinal herb for over 2,000 years, and has been used to treat a wide range of muscular, respiratory, skin, hair and scalp problems. Sage Essential Oil has an antispasmodic action which is why it is so valuable in massage or baths for easing cramps, muscular aches and pains and stiff joints. Sage Essential Oil helps regenerate skin cells, making it useful in skin care treatments for scars, stretch marks and acne, as well as stimulating new hair growth. In massage blends its stimulating properties can be used to optimize the immune system and speed up the removal of harmful toxins and cellulite from the body. It also stimulates the nervous system by increasing the activity of the adrenal cortex, and research has shown it can improve memory and cognition and may be helpful with affective disorders. 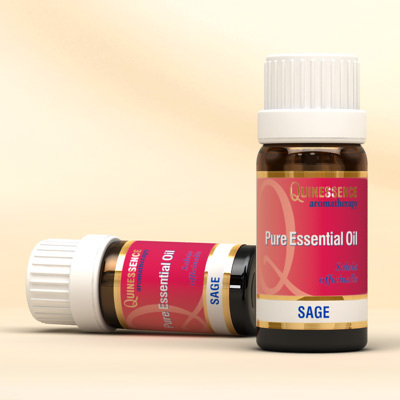 Traditionally used to treat sweating and menopausal hot flashes, as well as to alleviate the associated menopausal symptoms, Sage Essential Oil appears to have an estrogen-like effect on hormones, making valuable for balancing the feminine cycle and treating the menopause. Sage is a powerful essential oil and should be treated with respect, plus it is contra-indicated with epilepsy and during pregnancy due to the content of b-Thujone.